Dr. Mathur is subject matter expert in the area of International Standards Certifications, Research & Development, Scientific Trainings, Accreditations. His pioneering projects have been Implemented under the aegis of now (MEITY) Ministry of Electronics and Information Technology, Government of India. He has setup three R&D Centers for (CMET) Centre for Materials for Electronic Technology - A Scientific Society under MEITY, with sophisticated equipment at Pune, Hyderabad and Thrissur for Research and Development. 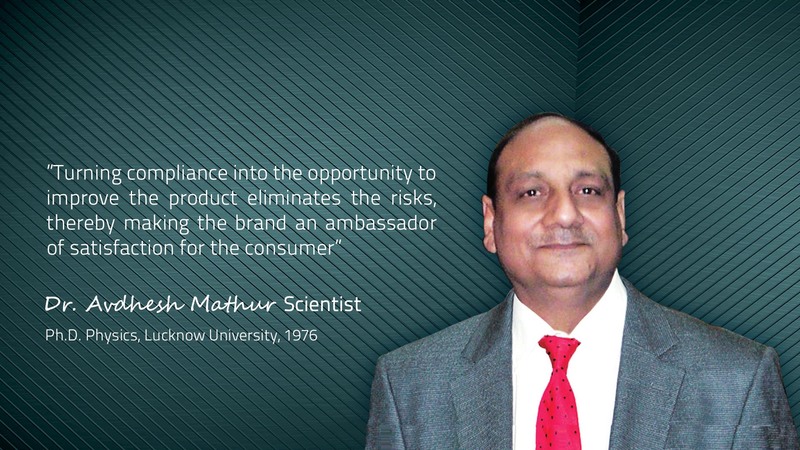 Dr. Mathur has National and International exposure for QMS, EMS, IECEE-CB, IECQ, Safety Mark and various other certification areas. His vivid personality is reflected in multi-facet roles which he has embraced in his scientific journey, as an Advisor, as a Researcher, as a Mentor, as a Scholar, as Director-in-charge and as a Trainer. His unparalleled contribution to the Government Projects and further it’s adaption by various Indian States and Universities for the benefit of the Society has a unique stand in history. Dr. Mathur’s held the role of CEO for STQC Certification Services, a Government of India Certification Body (CB) under the Aegis of, MEITY allowed him to spearhead the responsibility for Developing, Implementing and Maintaining the Certification System as per International standards and IAF guidelines. STQC Certification Services has more than thousand organizations as its customers for Quality Management Systems (QMS), Environment Management System (EMS) and Product Certification based upon (IEC) Standards such as Reliability, Conformance Testing and EMI/EMC etc. Dr. Mathur was instrumental in getting the Government’s Certification System accredited from RvA Netherlands and QCI India. Dr. Mathur is recognized by IRCA as Lead Trainer for QMS. His empanelment includes his roles in various capacities such as a Lead Assessor, Auditor and Product Certification Expert & Agency Inspection Specialist. In the Training Space Dr. Mathur commanded Indo-German Bilateral Program under which five training centers were empowered to give training to in-service engineers with his robust and exemplary Training Methodologies in the areas of automation, PLCs, EMT, EMI-EMC and quality etc. He established two Training Centers known as (CETEs) Centers for Test Engineering from inception in addition to managing three existing Centers. He has conducted research in complex areas such Semiconductor Physics, Ultra purification of III – V Compounds and Di-electric relaxation Studies at Center for Materials for Electronics Technology. A Scientist by birth Dr. Mathur have published 14 research papers in journals of international repute, in addition, Various National and International organizations eye for his invited tech talks. He has been a distinguished Member Secretary, (EMDC) Electronic Materials Development Council of MEITY, under his leadership he conceptualized, implemented and monitored several R & D projects in the areas of ceramics, glasses and semiconductor materials. The Technology projects on “High Purity Silica Glasses and “Ferrite Grade Barium Carbonate” were later on transferred to Industry for commercialization. He has been trained at various international institutes and universities. University of Ulster, Coleraine, Northern Ireland, UK. University of Surrey Guilford (UK). Siemens Training Centre Karlsruhe, (Germany Perkin-Elmer Corp., Norwalk, USA and Fraunhofer Germany. Institute IZM, Berlin (Germany) TAE, Ostildern, Germany and he is also the recipient of Malcom Baldridge Quality Award (MBQA). The Mobile Association is indeed proud and honored to have in its team Dr. Avdhesh Mathur.